AT&T killed its unlimited data plans recently due to large volumes of data, most probably from the Apple iPad. From $30/month for unlimited plan to $25/month for 2 GB of data bandwidth transfer per month for the Apple iPad. $20/month for iPhone limited to 2GB as well. For some it may seem like 2GB is enough, but it really depends on how often you use your data services. I was moving to a new apartment, and the leasing office told me that I could get either Verizon FiOS or Cox Cable for my internet and TV. I said to myself "Gee, that’s swell," because I was thrilled Comcast wasn’t force fed to me like usual. I had always dreamed about trying out that new Verizon FiOS too. Finally, real true capitalism can work because I actually get a choice. Photoshop enhanced Space and 3D Planet scenes created have always fascinated me. They are inspiring and makes me imagine what NASA and our nation will accomplish in the future. That's Exactly What Skynet Would Say! Today, I was searching for information about artificial intelligence algorithms on Wolfram Alpha, when it dawned on me that perhaps I should first determine whether Wolfram Alpha is actually Skynet (in order to make sure I'm not using some biased search engine). Futuristic cities have always fascinated me, as a fan of SciFi TV shows, movies, and digital art, futuristic city designs always bring me inspiration. Everyone can find quite a lot of stunning illustrations on sites like deviantArt. If you ever wondered where all your windows error reports go after that nasty system fail. Well now you know. However, Windows 7 doesn't crash as much as Vista and previous versions. 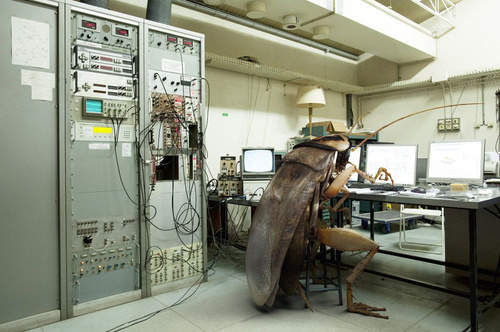 Maybe the bug is working hard after all.